Villeroy & Boch stands for outstanding design and the best functionality. Center Parcs stands for cosiness and carefree holidays in nature. The two groups complement each other perfectly and therefore want to enter into a long-term cooperation. On 12 March 2019, Pascal Ferracci, CEO of Center Parcs Europe, and Andreas Pfeiffer, Bathroom and Wellness Director at Villeroy & Boch AG, signed the contract for the planned cooperation at ISH in Frankfurt am Main. The multi-year contract is to be part of an extensive renovation programme at Center Parcs that will focus on quality, innovation and sustainability. "The product quality of Villeroy & Boch and the standards of the holiday resorts of Center Parcs are a perfect match. From joint projects we have already implemented, we know that we have similar requirements in terms of functionality, hygiene and sustainability. 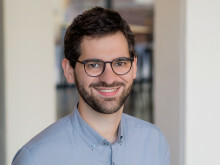 For us, therefore, long-term cooperation was the next logical step towards achieving the best possible results in the future and developing forward-looking concepts", explains Andreas Pfeiffer, Bathroom and Wellness Director at Villeroy & Boch AG. The partnership with Villeroy & Boch is also a logical step for Center Parcs. “We are very happy with this partnership with Villeroy & Boch. Both our A brands have a long track-record and are frontrunners in their markets. We share the ambition to create a unique customer experience that focuses on comfort and sharing special moments and real quality time together,” states Pascal Ferracci, CEO of Center Parcs Europe. “The partnership with Villeroy & Boch enables us to live up to these ambitions. This collaboration is a perfect match, not only when it comes to quality, but also when you take our pay-offs in consideration: ‘Just us, at last’ of Center Parcs and ‘Love the moment’ of Villeroy & Boch”. 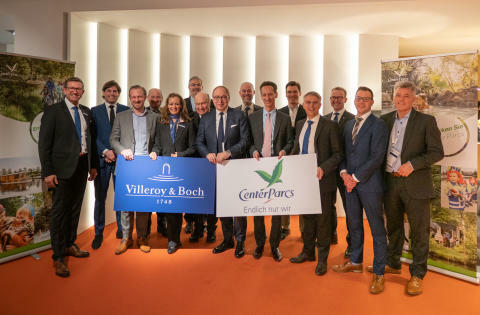 In recent years, the partnership between Villeroy & Boch and Center Parcs had already proved its worth at holiday parks in the Netherlands and Belgium, and most recently in the construction of Park Allgäu, which opened in 2018. The holiday cottages and restaurants in the parks were furnished with high-quality ceramics from Villeroy & Boch. The companies expect long-term cooperation to enable them to act both flexibly and with foresight in the planning and implementation of major construction projects. Villeroy & Boch will contribute to the development of new offers in the holiday cottages and central facilities of the Center Parcs, such as the Aqua Mundo and the Market Dome. This will improve the customer experience. As part of the partnership, Villeroy & Boch will support Center Parcs in the development of themed toilets in the public facilities. Both the design and the materials will be fully adapted to the atmosphere in the park and the bathrooms will be equipped with the latest sanitary solutions. The roll-out is to take place in phases: during the renovation of existing parks and during the construction of new ones. The first innovations are being implemented at De Eemhof in the Netherlands. For over 50 years, Center Parcs has managed holiday resorts at 24 locations in Germany, the Netherlands, Belgium and France. The chain is Europe's largest provider of short holidays and is part of the Pierre et Vacances Center Parcs Group. Center Parcs specialises in family holidays and offers a wide range of activities for the young and old. These include tropical swimming paradises, children's playgrounds, high ropes courses and even sailing and windsurfing facilities. Culinary delights are available at the numerous restaurants and cafés. Villeroy & Boch has been beautifying the everyday lives of its customers with ceramic products of the highest quality since 1748. The premium brand's portfolio includes products from the Bathroom and Wellness and Tableware Divisions. Architects, planners and interior designers are accompanied by Villeroy & Boch as partners before, during and after a project. The "360° Customisation" service offers custom solutions for ceramic parts and fittings. Here, logos, décor and individual colours can be implemented according to the company's corporate identity and interior design.